You will join our ‘Financial Institutions’ team, a team of 50 Financial Risk Management Consultants (94% have a quantitative background). Your time will be divided between the Valuation Desk and Financial Risk Management projects. Derivative valuations are being challenged as a result of recent crises in the financial markets and an increased complexity of financial regulations. As part of the team at the Valuation Desk, you will perform independent valuations for numerous financial instruments. We are looking for new talented colleagues who would like to combine their quantitative background with consultancy and finance. Do you like to develop programs, interact with clients and create solutions? Start your career as a Consultant at our unique Valuation Desk! You will join our ‘Financial Institutions’ team, a team of 50 Financial Risk Management Consultants (94% have a quantitative background). Your time will be divided between the Valuation Desk and Financial Risk Management projects. This means that you will work for a broader range of clients and sectors. The unique combination of being a subject matter expert at the valuation desk combined with general risk management knowledge will help to quickly develop your soft skills (e.g. communication, teamwork, project planning). This role will bring you a variety of tasks and responsibilities. Your work extends beyond performing valuations. You provide customized advice, follow up on questions from our clients and provide support in the discussions with accountants. You will support all our market groups. At the Valuation Desk you support mostly corporate and public sector clients. In the Risk Management projects you deliver support to the Financial Institutions. We are a leading international consultancy firm focused on Treasury Management, Risk Management and Corporate Finance. From our offices in the Netherlands, Belgium, United Kingdom, Switzerland and United States our 160 consultants service corporates, financial institutions, public sector entities and NGO’s. We encourage our employees to share their ideas and to remain at the forefront of innovative services and solutions. We offer the possibility to specialize and develop professionally, taking on personal responsibility for client projects from an early stage. Our culture is transparent and thrives on the open exchange of ideas and knowledge between colleagues. 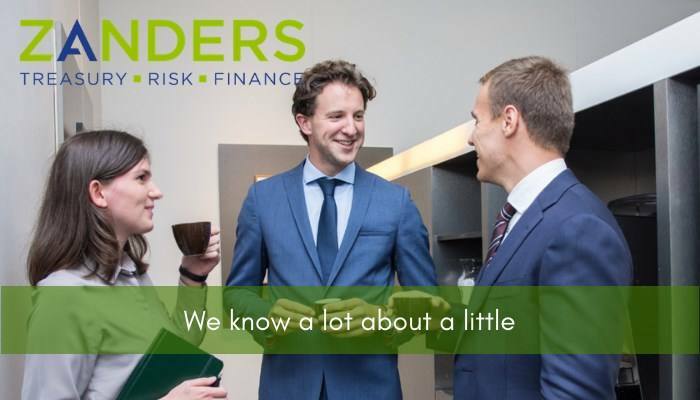 Please send your application for Consultant: Valuation Desk / Financial Risk Management at Zanders in Bussum including your CV via our website.